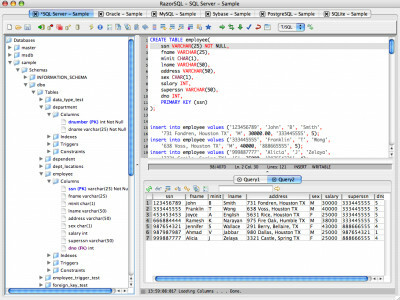 RazorSQL (OSX) 4.1.5 is databases & tools software developed by Richardson Software. Query, edit, browse, and manage databases from one tool. 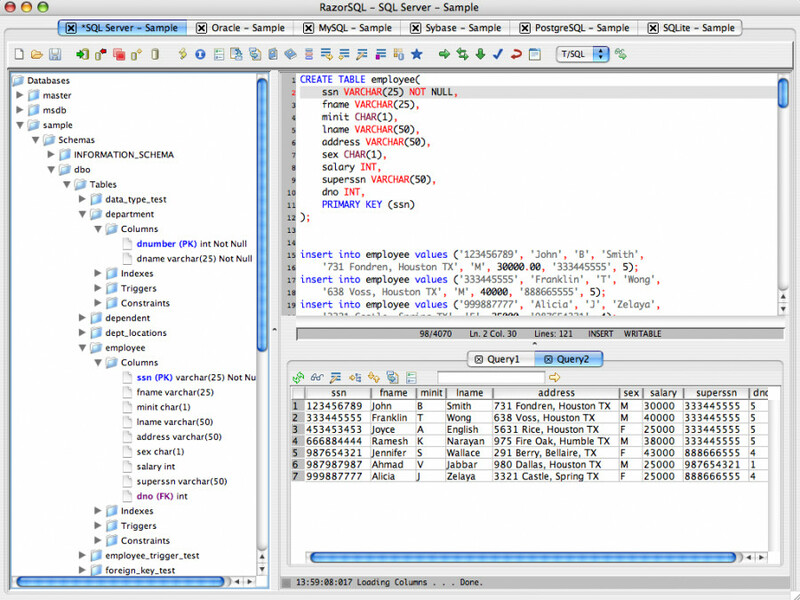 RazorSQL includes a built in relational database. Drivers are included for all major databases. Connect to other databases via JDBC. Run SQL scripts; do SQL programming; visually edit, create, alter, drop, and view database objects; visually build queries; import and export data; and browse databases with the navigator. RazorSQL supports 20 programming languages. This program is shareware, which means you can download and use RazorSQL (OSX) 4.1.5 for free during 30-days trial period. After this period you gonna have to buy RazorSQL (OSX) 4.1.5 software for $49.95 or uninstall the program. RazorSQL (OSX) 4.1.5 supports different languages (including English). It works with Mac. Latest RazorSQL (OSX) 4.1.5 does not contain any spyware and/or advertise modules, allowing installing it with no worries concerning valuable information loss. Our website has thoroughly tested business product RazorSQL (OSX) 4.1.5, written the review and uploaded installation file (12817K) to our fast server. Downloading RazorSQL (OSX) 4.1.5 will take several minutes if you use fast ADSL connection.